Correlation is not causation. But it is always exciting to see a good correlation between two variables that one assumes will correlate because of some theory or other. According to the ‘Saturated Greenhouse Effect’, a controversial theory developed by Hungarian physicist Ferenc M. Miskolczi, adding carbon dioxide to the atmosphere will result in a reduction in relative specific humidity. According to data from the NOAA Earth System Research Laboratory, relative humidity has been generally trending down, especially at higher elevations, since 1948. Click on the above graph for a better/larger view. Update, Thanks to Nick Stokes for his comment in the thread explaining that the Miskolcki theory only says there can be a reponse of decreased specific humidity in response to warming. A fall in relative humidity is nevertheless consistent with the Miskolczi’s law, but not with the current IPCC-sponsored paradigm. 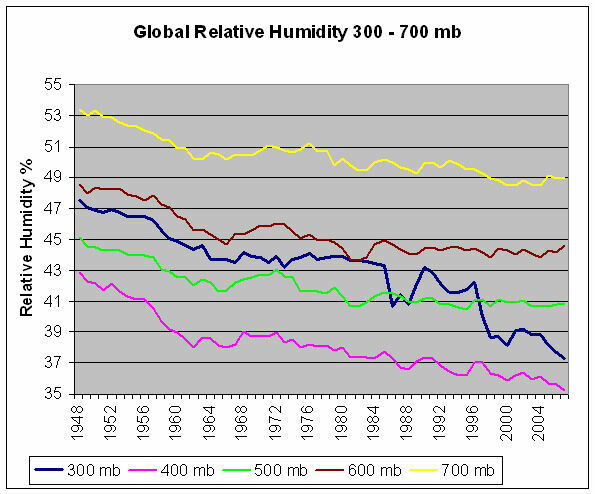 Update, Following is the graph of specific humidity via Ken Gregory, also please read his comment in the thread that follows. Hmmm…but doesn’t 300-700 mb correspond to stratospheric levels? Conventional greenhouse theory predicts cooling at these altitudes, doesn’t it? I’ve got a feeling that this might correspond to lower humidity as well. And in terms of mass, most of the atmosphere is at pressures (altitudes) higher (lower) than 700 mb. I’d like to see the graph for 1000 mb. No those pressures are well and truly in the troposphere. just scroll down a little there are two charts one for pressure profile and one for temperature in the latter you can identify the tropopause by where the lapse rate inverts. Here you can select the level the latitudinal meridional zones. The key to obtaining high temperatures from rising GHG is the assumption in the models that relative humidity stays constant (based on lapse rate theory for a simple atmosphere). More GHG means more moisture under this assumption, and water vapor is a strong GHG. BUT if Miskolczi is right (and Spencer shows a mechanism for this) then RH is NOT constant with increased GHG but decreases. This would show negative feedback, not positive. To be fair, the RH measurements are difficult to analyze due to poor geographic coverage and instrumental issues (changing radiosonde instruments over time, for example). But it sure doesn’t look like a slam dunk for constant RH. Since this is a key assumption of the models, don’t expect to see this graph discussed much in MSM. Luke we are aware of the problems with the radiosonde data especially the early stuf but one does the best one can with the best available data. Craig Ferenc Miskolczi has run a 61 year series analysis of the effect on total optical depth that is interesting I have some hope that he’ll publish but Ken Gregory posted a brief summary of results on CA forum. Into a cloud, let’s say a cumulonimbus, the specific volume of water vapor is 0.997 m^3/Kg, while in the air with RH of 85% the specific volume of water vapor is 39.22 m^3/Kg. This means that 1 kg of water vapor at 2000 m altitude fills a smaller volume that at the sea level. This means that the decrease of RH at lower pressures (higher altitudes) is a consequence of cloudiness or to the concentration of more water vapor into smaller spaces. It is based on the latest studies and shows the highest probabilities of success after some 400 model runs. I’ve plotted the above NCEP humidity data for all the levels available and for Specific Humidity as well (which is supposed to increase in lock step with temperatures). Relative Humidity is supposed to remain more-or-less constant and Specific Humidity is supposed to rise along with temperatures. More accurately, the model’s predict a bigger increase in Specific Humidity at the tropopause (300 Mb to 200MB) than for the surface (where some models predict a slight decline in SH). But the opposite trend is happening in the NCEP data with the surface rising very slightly and higher levels declining very slightly. Relative Humidity is falling at all levels and, especially, at the important tropopause heights (200 MB is not available in the NCEP dataset). Specific Humidity. (Constant rather than Increasing). Relative Humidity. (Falling rather than Constant). “one does the best one can with the best available data” – when have sceptics ever settled for that!? If there were problems with the radiosonde humidity sensor design changing over time I’d expect to see some step level changes. I don’t see any although the decline seems to be consistently steeper until the mid 1960’s. No doubt some of the AGW data torturers will find that when the error bands are made wide enough this data ” is consistent with the models”. Or the data will be simply ignored. Mark Duffett: About 3/4 of the mass of the atmosphere is in the troposphere. Half is below 500mb(about 18000 feet). You might want to do a little basic research before reducing the signal/noise ratio here. I would think we ought torture these data as much as sceptics have tortured the surface records. Fair is fair surely? I would be very interested to know what the limitations of the data are – please. Pan evaporation has dropped in step with the radiosonde. That would be at the surface pressure, wouldn’t it? Alternate headlines for this post – AGW “Tipping Point” theory gets a case of Vapor Lock. . .
You’re quite wrong on this one. Miskolczi doesn’t mention relative humidity anywhere. He talks about water vapor content, which is specific humidity. That’s the only measure which determines optical depth, which he claims is the controlling principle. It is the measure that affects IR absorption. Relative humidity is only relevant when considering a change of state – evaporation or condensation. It will go down with rising temperature, if the water vapor content is constant or even maybe rising. And yes, the NCEP model reconstructions are not gold standard. How good is the Humidity? The humidity analysis is believed to be the weakest of the primary atmospheric analyses; i.e., Z, T, U, V, and Q. The other primary variables (Z, T, U and V) and their gradients have to be internally consistent. One can not change T without changing U, V, and Z. As a result, the internal consistency provides a check and constraints on these fields. The humidity analysis, however, is unconstrained (except for q <= q-sat) and is effectively produced by a univariate analysis with no dynamical constraint on the gradients. Then there is the sampling problem. The humidity has many small-scale features and a single measurement may not be representative of a grid box average. By the way, did I mention instrument errors? Trenberth doesn’t think highly of this NCEP data, and particularly says the values over ocean are unreliable. All the time Luke all the time. It’s the doctored by incorrect weighting methods, mined or cherry picked data that we have problems with. There is a difference in case you didn’t know. Strip bark bristle cone pines ring a bell? good point, but it applies to all. Oh I agree Jan and thanks for playing. And simultaneously answering Jen’s question – Jen the authors of the said paper have offered the caveat – not me. However there are some lessons in the NOAA satellite series from our good friends Christy and Spencer which needed some corrections for drift and sensor degradation – which turned a cooling signal to a warming. And previously radiosondes have had issues with sun exposure on instruments which needed correction. So all I’m saying with radiosonde probes there appears to be many issues. Are we all here up to speed with those issues?? On the other hand maybe the data are correct and it’s a revolution (but I doubt it). We’ll see as the science proceeds. The modelers then fine tuned other variables to make the models look right. Now with a critical assumption falsified they are left with garbage. Svensmark has shown about twice the correlation with solar variability and temperature compared to CO2 and temperature but the modelers also assumed constant solar influence. I have only a little concern about Svensmark’s work. The correlation can hardly be questioned, but I am trying to find out if the highly variable solar UV and x-rays might be part of the explanation by forcing the expansion and contraction of the upper atmosphere. The CLOUD experiment at CERN should help decide if it is the cosmic rays influence on cloud formation that explains the solar-temperature correlation. The people questioning the data for a 10%! change in RH at 300 mb are a joke. A change this large cannot be instrument error. In comparison the questions about temperature measurements are arguments about a half a degree from temperature measurements that are done on roofs, next to parking lots, outside the air conditioners exhausts, next to the barbeques, and mostly done in cities with a huge urban island effect. The graph shown in this article is about Relative Humidity. 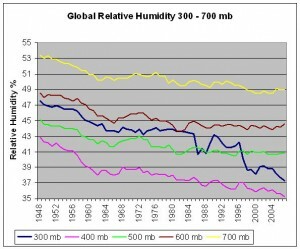 I’ve plotted Specific Humidity for 300 mb and 600 mb and the trend is also declining, specially at 300 mb. There is not too much differences between trends of RH and SH. On physics and maths Hungarians are always right – well 99%, plus or minus half a percent (95% confidence limits). See, history rules. If Luke changes his name to Lukas I will believe him. You can find out, too, by clicking on the link there. Gary P The models that assume constant relative humidity are wrong. The developers took an easy way out and assumed constant RH. Can anybody point to a replicated study that justifies this assumption? Can you point to a single GCM model (post 1970) that makes this assumption? Some evidence? You’re just wrong – they don’t. I don’t think Nick Stokes is Hungarian. I’ll bet he can’t even play the violin. I see… The same kind of magic from Trenberth’s energy-creator loop? Thanks for your correction. I have put a strike through ‘relative’ and added ‘specific’ humidity to the original post. I understand a fall in relative humidity is nevertheless consistent with the Miskolczi’s law, but not with the current IPCC-sponsored paradigm. On physics and maths Hungarians are always right – well 99%, plus or minus half a percent (95% confidence limits). I agree with you there, as far as trained mathematicians are concerned, there were too many in the past and also at present to ignore. See, history rules. If Luke changes his name to Lukas I will believe him. It would have to be “LUKACS” if you want it in Hungarian. I still wouldn’t believe him though, not that there is any substance to his postings lately, most of it is childish abuse. Pity, he used to be quite clear and coherent. Oh well never mind! No, falling relative humidity (RH) falsifies the climate models, because they all project constant RH with global warming, which implies increasing specific humidity when temperatures increase. The falling RH shows that the large positive feedback in climate models is much too large, and may be negative. This spreadsheet shows a series of specific humidity graphs starting at row 72. This shows specific humidity has fallen 14% at this level since 1948. This is a BIG change. This shows that if water vapour is held constant, increasing CO2 would cause a small increase in optical depth, and therefore a small temperature increase, but with variable water vapour, the trend is reduced. This shows that adding water vapour near the surface has almost no effect on the OLR, but adding water vapour in the layer at about 400 mb has a large effect on OLR. (A reduction in OLR causes a forcing as the incoming solar radiation exceeds the OLR, so temperatures must increase.) The falling humidity at 400 mb causes a significant increase in OLR, offsetting most of the effect of increasing CO2. The increasing humidity up to 2005 near the surface has no effect on the OLR. But the increased humidity there may enhance the evapo-transpiration cooling of the surface. We all recognize that humidity data has uncertainty, but I have not been able to find any indication that instrument changes over time would result in a trend change. An independent check of falling humidity in the mid troposphere is model projected versus measured temperatures. The models predict a “hotspot” at about 400 mb based on a constant RH. The hotspot would not exist if water vapour did not increase in the mid troposphere. The absence of the hotspot from observations confirms the observed reduction in mid troposphere humidity. You say the models do NOT use steady humidity for input. I will accept that. Can you tell us how much variance there is in the humidity in the model outputs??? (NARR) data [Mesinger et al., 2006]. 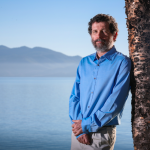 He even co-wrote a paper http://www.climatesci.org/publications/pdf/R-337.pdf. Pielke avoids ocean measurements, sticking to the land based data, so that might be a nod to problems noted by Trenberth with the sea data. The radiosonde data doesn’t compute at all. That the models are wrong is hardly new – but the essential physical relationships have to hold. The satelite data is showing large increases in water vapour in the atmosphere. Much more in accordance with basic physics? Thanks Ken Gregory. And I have posted one of your ‘specific humidity’ graphs above. 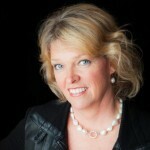 @Jennifer… Thank you for your useful interesting article. Please, consider that I used NOAA databases and I’m not sure if they are consistent. Notice that the linear trend for relative humidity at 1000 mb increases; the plot is similar to HadCRUT-3 plots on fluctuations of temperature. I see again the appearance of the 400mb Specific Humidity plot of Ken’s. This is cherry picking. I am not a fan of NCEP reliability, but they do give plots at levels from 1000mb to 300. You have to look to find one that is falling – the full set is compressed on to a single plot (shifted to appear as deviations from present, for comparison) here. The lower levels, which contain most of the water, are rising. Thanks for the Hungarian spelling of Lukacs. Is that pronounced like ‘goulash’? And, more to the point, is Hungary getting hotter, colder, wetter, drier, windier, or stiller? Or none of those? P.S. I suspect you play the violin. Are you there? While we are doing languages, can you tell me the proper pronunciation for the name Kaj Sand-Jensen? S/he wrote a funny paper on how to write boring scientific papers. Climate scientists to note. As to the the weather, we had a warm spell in the early 1950s so much so, that for a few years we tried to grow cotton and rice (emulating the great CCCR experiment). Did not last long though. Lately, same as everywhere else, same old same old. And Nick is right when he notes that lower water is rising; so is low cloud level; high water and cloud is declining; this is consistent with M, Steve’s reworking of M and Lindzen’s Iris; it is not consistent with the THS, Dessler, Soden and AGW; the issue of whether the low clouds conform to Spencer’s stochastic cause concept will be tested by temperature trends; so far Spencer is winning. On another tack, Svensmark’s cosmic ray theory should be vindicated [or not] soon as the sun appears to be in a [baby] grand minimum. Bill Illis, I’ve only just read your comment with links (5.09am). Nick, Thanks for pointing out that the graph I copied from Ken was not representative. But how do I resolve what you have linked to with what Bill has shown? I believe the two plots you linked to there, including mine, and also Ken’s plot, are from the same NOAA data that Ken linked to. Bill’s plot, by showing absolute values rather than differences from current, as I did, just makes it hard to see the trend. But note that the top curves, which represent lower atmosphere, are rising in Bill’s plot, and by larger amounts. Here is a discussion (my blogname is pliny) of the total water in the profile, as estimated by four such programs (2 are NCEP). It’s probably the best measure to test FM’s claim, and to test water absorption of IR. One is definitely increasing with time; the others are ambiguous. he published quite widely if I remember. BTW, which one do you mean, the father or the son? And in 2009, on the NOAA 61 year global average database, he found another empirical estimate = 1.86875. According to this database, the atmosphere’s moisture content during 61 years from 1948 to 2008 in global average decreased by about 1%. I’m asking the question and hoping for a long answer. Jennifer, I just plotted all the values available in the NCEP dataset (I think I got them from Ken Gregory’s spreadsheet a few months ago). I think it is important to see all the levels because the models have different predictions for different levels and for different latitudes as well. For example, here is what GISS Model E predicts for the change in Relative Humidity by Height in absolute RH% – very, very small changes (0.7% change in absolute terms either way is very, very small compared to what is happening in the NCEP relative humidity data). GISS Model E also plots specific humidity but they use a format which is not particularly helpful. … there should be an increase in Specific Humidity at all levels (up to 100MB) and particularly at the tropopause hotspot. But Specific Humidity is FLAT (except for the surface where it seems there is a small increase not really predicted in the models and for which Ken shows has no impact). I can’t say it’s untrue. It’s just too unclear. There’s no NOAA database on which you’ll find a 6-figure estimate of tau. I presume it’s a Hartcode calculation that he’s done, but how the database (I’m guessing it’s the NCEP one) comes in is unclear. And the last sentence is also vague. I imagine it may be based on something like the plot shown in this comment by Ken. If so, it’s based on a linear regression (the 2008 value is actually 1% higher than the 1948 value). And again, it depends on the period you choose. Starting in 1964, for example, you’d see an increase. And Coho, yes, there’s been a lot of discussion about the possible underestimating of high level humidity by GCM’s. The models aren’t perfect; they’re trying to find out if it has happened and why. And Marcus, no sarcasm – just an attempted in joke, with a fragment of a Tom Lehrer song in my head, that won’t bear further examination. The nearly exponential rise in the amount of water vapor with increasing temperatures and constant humidity is offset by the negative feedback of lower condensation levels. To clarify, here’s an online “relative humidity” calculator. Plug in a temperature of 15C, the supposed average temperature of earth, leave in the default surface pressure of 1013.25 mbar, and plug in a relative humidity of 70%, the supposed average for the earth. You’ll get a dewpoint of 9.577 C.
Now assume the temperature has increased to 17 C, leave the relative humidity at 70%, and you’ll get a dewpoint of 11.493C. Now go to this second online calculator for lifting condensation level. Plug in the temperature of 15C, the pressure of 101.325, and the dewpoint of 9.577C from my first calculation. The clouds will start to form at a pressure of 93.3889. 11.493C from the second calculation. The cloud level will drop to an air pressure level of 93.309.
presumably most of the water vapor has already been wrung from the air. as opposed to the 8.363C from the clouds created from a ground level of 15C. That’s a difference of 1.884 C. , only 0.116C less than the 2C difference in ground temperatures in my example, 17C and 15 C.
Of course there is a question of just what is average cloud thickness as a function of humidity ,temperature, and air pressure, which would undoubtedly throw my example off a little. humidity will increase with temperature, but relative humidity will decrease. Sorry, I got that wrong. Cloud level would rise a little from an air pressure of 93.3889 to 93.309. Nick I think most people are aware that the average of a sinusoidal function about zero is zero but what happens if you calculate the average over only part of the cycle. A naive conclusion about the Global Warming that we experienced in the recent past is that GW should have increased evaporation rates and absolute humidity levels in the troposphere. My understanding from the earlier discussion is that since 1948, absolute humidity levels have been either constant or slightly decreasing in the mid to upper troposphere, which is where most of the meteorological action is. Since I don’t have the time to plow through Miskolczi’s lengthy argument, I’ve created a simpler one to explain the Miskolczi Effect. In a nutshell: Increased CO2 levels in the troposphere accelerate water droplet formation in clouds. How? Background. H2O gas comes into contact with an individual nascent water droplet, and condenses on the surface. The rate at which this occurs is proportional to the surface area of the droplet. At the same time, airborne CO2 is dissolving into the water droplet. (Rainwater is slightly acidic. If I remember correctly, the typical pH is less than 6. In the absence of pollution by humans, CO2 contributes most of the acidity. NOx and sulfur oxides contribute less.) The added CO2 increases the volume and surface area of the droplet slightly. This increases the condensation rate for the single droplet, and decreases the time needed for the droplet to reach its critical mass. The net effect of the increased atmospheric CO2 is to decrease the residence time of H2O gas in the mid to upper troposphere. Don’t believe it? Good! There’s an obvious lab experiment that you can perform to quantitate the Larry Theory. You may need to use fairly high CO2 concentrations to get readable signals. I don’t like the Larry theory. If you look up solubility of CO2 in air, it’s about 0.5 kg/m3, or 500 ppm by mass. And you’re talking about a fractional increase in that. Wouldn’t expand a raindrop by much. And Jan, I don’t know where the sinusoid comes from. It’s not part of M theory. The main thing is that NCEP reanalysis is based on thin data, especially over oceans, and it’s particularly thin up to the 60’s. Larry I’m impressed. Of course you are right. Why don’t you hang out at the reference frame anymore? If that’s too personal a question feel free to disregard. It’s not part of M’s theory but part of NS method of cherry picking the data to get desired but wrong results. What happens to the average of a sinusoid if you calculate the average only over part of the cycle? Bill Illis: But Specific Humidity is FLAT (except for the surface where it seems there is a small increase not really predicted in the models and for which Ken shows has no impact). Bill, I can’t agree with that. The plot you showed here showed about a 0.4 g/kg increase at sea level (mine did too), That’s about 4%. And this plot from GISS ModelE (generated from here) shows about 400 ppmv there, which is the same. CO2 is INFINITELY soluble in air. I followed your link, and that section in the Wikipedia article does not apply here. I was talking about a SMALL increase in the rate of droplet growth, in order to explain the SMALL decrease in absolute humidity in the mid to upper troposphere since 1948, in the face of increasing atmospheric CO2 concentration. I was not talking about bigger raindrops. Having a senior moment, are we? If you actually click the link to the table I pointed to, it is solubility of CO2 (or strictly, the equilibrium of CO2 related species) in water, at various partial pressures. And they have in bold the numbers corresponding to CO2 in air. Sorry if my shorthand caused confusion, but you only had to click. And SMALL is the word, less than 0.05%. 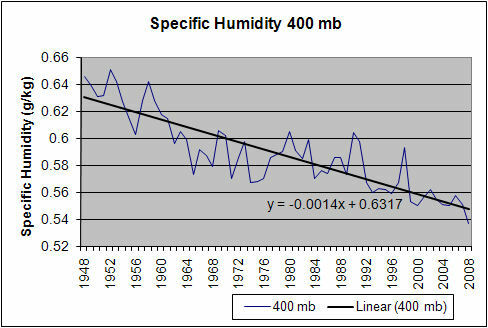 The variation (decrease and increase) in specific humidity is much larger. “Sorry if my shorthand caused confusion, but you only had to click. Compare the two expressions: “solubility in air” and “solubility in water”. The former has 2 fewer characters than the former. That hardly qualifies as shorthand. The usage of the former expression appeared to reflect scientific illiteracy on your part. I said that I clicked, and I actually did. Are you impugning my integrity? 2. Better still, get your hands dirty, do the bloody experiment, and publish the results in a reputable scientific journal. Oh, that Larry; I enjoyed your dissection of Spencer’s “A Saturated Gassy Argument” all that time ago. Nick, old chum, your links don’t work; but regardless, I think we all agree SH near the surface is increasing; from which 2 issues flow; firstly, by how much; and secondly that high SH is definitely not increasing, is at least flat and most likely decreasing; the point is that water has a different feedback depending on the level it is at; I still like Steve for under the [low] clouds along with Spencer and Braswell; and M and Lindzen above the [low] clouds. I Googled it trictly and got the result ” No results found for “solubility of CO2 in air””. This is because the phrase “solubility of CO2 in air” is a nonsense. No wonder you AGW promoters get the science so screwed up. Didn’t Nick just argue that trace amounts of atmospheric co2 are too tiny and inconsequential to affect climatalogical processes? I’m pretty sure he debunked the ocean acidification theory also. This is the thing about Larry’s Theory. I’m going to pop some popcorn and hang out for a while. I’d like to take credit, but I don’t remember that. Maybe you’re thinking of a different Larry. Someone else has scooped up the Larry franchise at WUWT. I’ve done one posting there, but as LarryF. Here is the link LarryF; the guy here is LarryR; how many of you Larrys’ are there? No, the phrase “solubility of CO2 in air” was shorthand for “solubility in water of CO2 at its concentration in air”. And I did the arithmetic, and you have the result. Total those CO2 species and you have about 1.4E-5 moles/L. Multiply by 44 gm (MW of CO2) and you get, well, about 0.6 mg/L. 600 ppm (OK, I got 500 last time – mental arithmetic has an error range). And that’s not saying CO2 can’t block IR, just that it doesn’t do much to bulk up raindrops (or make them grow faster). And Louis, I googled trictly also without success. The big story of the moment is the falsification of Steig et al by Ryan’O at WUWT and CA etc.. Slowly the climate facts are being untangled from within the tangled mess that AGW politics has made of science. One day they will look back on this period with great embarrassment. “Slowly the climate facts are being untangled from within the tangled mess that AGW politics has made of science. JH, Ya can’t embarrass these people with facts! When they can say that 315,000 people are currently dying yearly from AGW when there ain’t no AGW, facts are not a problem. “trictly” was a typing error – yours remains nonsense despite the specious retreat calling it “short hand”. I keep forgetting that Post-modernists belive everything is relative and that “solubility of CO2 in air” is not what it explicitly means. 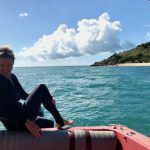 The fishing industry of north Queensland has been guttered….? Last post is supposed to be on another thread – and which explains the odd click-click the browser made just then. Sigh. I see that you mentioned Bolyai a few days ago. LIke Marcus, I wonder which one. Assuming Janos Bolyai, I would have thought that anyone familiar with his work, and that of Nicolai Lobachevsky, would be a convinced sceptic. If Euclid did not have the last word on geometry, then ‘foundationalism’ is done for. I prefer Otto Neurath’s boat metaphor. We should all accept that repairs to our knowledge are always necessary, and a squall can quickly make our boat turn turtle. Do you see ‘climate science’ as an eternal pyramid, built on rock steady foundations, or more like a cockleshell with a line squall approaching? In other words, are you a ‘true believer’, or a ‘sceptic’? Perhaps somewhere in between? No, GD, this analogy doesn’t work. Euclid’s boat didn’t turn turtle. People use his geometry all the time. It works. Non-U is still exotic. Climate science is just people working out stuff. They’ve found out a lot – some of that will turn out to be only part of the story. What’s pretty solid is that 2 W/m2 extra heat retained from our GHG. That will have consequences. Sceptics don’t usually grapple with that. Nick, that is so right but if GHGs were increasing where it really matters would not that extra energy have shown up as undeniable, measurable evidence by now? I didn’t say Euclid turned turtle – you concocted that rather obvious strawman. Euclid is afloat and highly useable. He was, however, only partly right, in that there is far more to geometry than he, or his disciples, realised. It ain’t what we know that we don’t know, but what we don’t know that we don’t know. Geometry was not ‘settled’ by Euclid, and may not have been settled by Bolyai, Lobachevsky, Riemann etc. So I beware when I hear, in climate debate, that the ‘science is settled’. That seems philosophically immature to me. 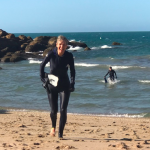 I still suspect that current ‘climate science’ is a cockleshell, with a line squall approaching, but that is only my opinion, based on seaweed and a wet finger in the air. We must all be careful about predicting the future. As I’ve pointed out before, fortune telling is illegal in some jurisdictions. The climate has warmed, which is what you’d expect. Folks here argue about whether the temperature record proves the AGW case. I contend that the radiative case has always been primary. 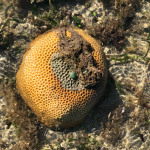 It could be undermined by a prolonged failure of warming, but that hasn’t happened. The temperature record may or may not be sufficient on its own to establish the case, but it reinforces it. What compelling nonsense your write – “the climate has warmed” can only be quantified by measuring temperature, which you then assert may, or may not, be sufficient on it’s own. How else could you possibly know the climate has warmed apart from noting the temperature. What, from the belief that increased CO2 will cause increased radiation to the Earth’s surface, if I interpret it correctly? That’s the theory but the measurements show otherwise, which you then counter by suggesting it could be “undermined by a prolonged failure of warming”, and that puts your argument fairly into the camp of pseudoscience as defined by Irving Langmuire. The problem is that AGW proponents treat the climate system as an isolated gas/water one coating an inert sphere in a vacuum. This model might have been appropriate in the days of Newton and steam engines, but these days we have discovered that the Earth isn’t an inert sphere but a highly active one, especially in the EM domain where at last 10,000 different solar modes have been documented affecting almost everything on the surface of the Earth. Furthermore there is an increasing body of scientific data linking internal Earth processes to the solar factor, and others not fully understood. Increased CO2 in the atmosphere is an effect, not a cause of warming. 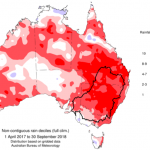 As I understand it, our Australian climate is strongly influenced by both El Nino, and the Indian Ocean Dipole. Both of these are warm plumes of water originating somewhere around Indonesia, which is, of course, highly volcanic. Do you have any views on this? Might it be outside the field of vision of those concentrating on the atmosphere? 2 w/m2 is ~ 1.5C; if the increase in GHGs has produced this where is it? This is before you exclude solar and ENSO contributions to temperature trends; I frankly can’t understand Nick’s comment about the primacy of radiative effects when there is no consequence to them. you are big on radiative physics. Maybe you can explain it to me. CO2 absorbs IR which apparently raises the excitation of the electrons. The emission does not happen except at particular quantum levels so the molecule may end up with extra energy for a period of time due to missing the level for emission. During this period the molecule colliding with another molecule can transfer some of this energy heating the other molecule. What I wonder about is why a molecule colliding with the CO2 does not transfer some of its energy to the CO2 molecule???? That is, why is this a one way street?? Why can not CO2 receive energy in collisions which it then emits??? Why is this process, depending on specific local conditions, not a simple transfer mechanism that averages out temps??? Of course, I have been doing a little looking for empirical data on this process. I haven’t turned up much yet. There is some old research that states that CO2 does NOT thermalise IR, so would not go the other way. The stuff I have read on CO2 Lasers does not make it clear that the heating comes from the IR or from the pumping process itself. Maybe you can point me to experiments showing the thermalisation of IR by CO2??? I think your query is about gas physics. There there is nothing special about GHG molecules. All energies etc conform to a statistical Maxwell-Boltzmann distribution. It is distributed by collisional transfer, and this is not one-way. The statement of local thermodynamic equilibrium just says that this happens very fast – faster than anything else you will be considering. In particular, faster molecules re-emit received radiation. So when a GHG molecule absorbs a photon, the energy is quickly redistributed. But the same goes the other way. When GHG molecules emit IR, it’s because their chance collisions with other molecules have put them into an energetic state (within the M-B distribution). It’s not because the individual emitting GHG have previously absorbed a photon. An important consequence is that air containing GHG emits only because of its temperature, not because of IR absorbed. Of course, absorption of IR is usually the heat source that allows it to emit while maintaining its temperature, but it isn’t part of the emission mechanism. The original experiments on the thermalisation of IR by CO2 were done by Tyndall in the 1860’s. I don’t know if he actually measured the temp rise, but he showed the IR was absorbed, so the gas must heat by conservation of energy. Thank you. So, CO2 cools AND heats surrounding gas. I notice I DID garble it earlier. I keep confusing electron energy levels with molecular bond flex in CO2.